With Thanksgiving just around the corner, Jack and I must give a BIG THANKS to the wonderful products that my son enjoys. I don't have to tell you how great these products are because they made the list - but click on the product name, which will connect you to their website and find out more about their yummy products! #10 Enjoy Life - Jack loves their Snickerdoodle cookies. #9 French Meadow Bakery - these individually wrapped frozen brownies are delicious and perfect if Jack needs a last minute treat for a birthday party or heading to a friend's house. 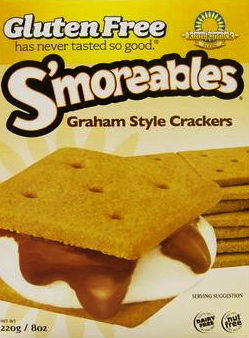 #8 Kinnikinnick - Thank you for making graham crackers!! Even though I can never say their name right, I LOVE their products. They are the only manufacturer that I know that makes GF graham crackers, their pizza crust is fabulous and their cookie and cream cookies - called KToos (like Oreos) are wonderful! #7 Van's Waffles - Whether it's Blueberry or regular, they are delicious! #6 Pebbles and Chex Cereals Okay, I listed two different products here but they fall in the same category. These cereals taste great, you can find them in the regular cereal aisle and you can make Pebbles rice crispie treats and different chex mix snack treats. Who doesn't like Cocoa Pebbles?? :) And I LOVE that Chex is going above and beyond by explaining what gluten is and doing commercials on their gluten-free products. #5 Kind Bars - healthy and delicious, what more could you ask for! Jack loves the Peanut Butter Dark Chocolate Healthy Grain Bars. #4 Jif Peanut Butter - Thank God my son is not allergic to Peanut Butter! I would say 5 days out of the week, Jack is having PB and toast for breakfast and dipping his Glutino Pretzels in a Jif Peanut Butter Cup. These To Go cups are great to throw in his lunch for pretzel and apple dipping or spread on his GF bread. #3 Glutino Stick Pretzels and Yogurt Covered Pretzels - the stick pretzels were one of the 1st products that I ever bought after finding out Jack had celiac disease. Jack now dips the pretzels in Jif's Peanut Butter ALL the time! For the Yogurt Covered Pretzels, Jack loves these, he calls them "white cookies." #2 Udi's Sandwich Bread - we go through a lot of this, but my son loves it!! We use it for toast, make little pizzas, sandwiches, etc.! I'm starting to buy the Whole Grain more often now than the White sandwich bread, but both are great!! There you have it, Jack's Top 10. We are THANKFUL for these products and their tastiness! Thank you for making my lil' guy happy, which makes for a happy momma! Thank you for including our sandwich bread in your list! I'm glad to hear your son loves it as much as we do. We're very thankful for people like you, who help spread the joy of gluten free foods. Thanks again! Who in a million years would have guessed Betty Crocker would create a gluten free line? Not me, but awesome! Hi neighbor! Great list! As you know, I am GF and so are my two boys. We also have some favorites! Snyders GF pretzel sticks - they are less expensive than the other brands and taste great. Even my husband likes them. (He's from Philly so he's serious about his pretzels.) I buy these at Publix in the chip aisle. Udi's GF granola - You can find this at Walmart now in the cereal/granola section. It's a great yogurt topper. I just found this recently and I'm glad! Rudi's bread - We keep this in the freezer and when we need to make a sandwich I take 2 slices out, put them in a sandwich bag and microwave for 20-30 seconds. Let it sit in the bag for a few minutes to retain moisture. It's wonderful and soft! Trader Joe's GF frozen pancakes - Yummy and easy. There are many, many more. I am so thankful that so many companies are finally recognizing the need for GF products! When I went GF almost 8 years ago, there wasn't much out there and it tasted like cardboard. Now we have so many delicious alternatives!